Dinosaurs are a group of now-extinct, terrestrial reptiles in the order Dinosauria. They lived during the Mesozoic Era, from about 225 million years ago to 66 million years ago. Species of dinosaurs ranged from chicken-sized creatures such as the 2-pound (1-kilogram) predator Compsognathus to colossal, herbivorous animals known as sauropods weighing more than 80 tons (72 metric tons). The sauropods were larger than any terrestrial animals that lived before or since. Some dinosaurs were enormous, awesomely fierce predators, while others were mild-mannered plant eaters. The word dinosaur is derived from two Greek words meaning "terrible lizard." The name comes from the fact that the remains of the earliest dinosaurs discovered were very large and showed they had a lizardlike appearance. 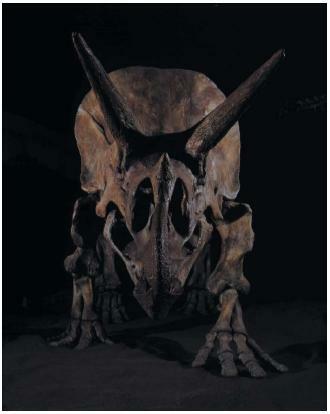 The dinosaurs shared some common physical characteristics, such as the presence of two openings on opposite sides of their skulls and 25 vertebrae. However, the dinosaurs also differed from each other in many important ways. They displayed an enormous range of forms and functions, and they filled a wide array of ecological niches. Some of the dinosaurs were, in fact, quite bizarre in their shape and, undoubtedly, their behavior. Most species of dinosaurs had a long tail and long neck, but this was not the case for all species. Most of the dinosaurs walked on their four legs, although some species were bipedal, using only their rear legs for locomotion. Their forelegs were greatly reduced in size and probably used only for grasping. The species that walked on four legs were all peaceful herbivores. In contrast, many of the bipedal dinosaurs were fast-running predators. The teeth of dinosaur species were highly diverse. Many species were exclusively herbivorous, and their teeth were correspondingly adapted for cutting and grinding vegetation. Other dinosaurs were fierce predators, and their teeth were shaped like serrated (notched) knives. These teeth were undoubtedly used to seize and stab their prey, cutting it into smaller pieces that could be swallowed whole. Until recently, it was widely believed that dinosaurs were rather stupid, slow-moving, cold-blooded creatures. However, some scientists now believe that dinosaurs were intelligent, social, quick-moving, and probably warm-blooded animals. This question is still rather controversial. Scientists have not yet reached agreement as to whether at least some of the dinosaurs were able to regulate their body temperature by producing heat through metabolic reactions. Humans have never lived at the same time as dinosaurs on Earth. Yet, a surprising amount is known about these remarkable reptiles. Evidence about the existence and nature of dinosaurs has been obtained from fossilized traces left by these animals in sediment deposits. Bipedal: Walking on two feet. Embryo: The earliest stage of animal development in the uterus before the animal is considered a fetus. Extinct: No longer alive on Earth. Fossil: Evidence of plant or animal life preserved in earth, usually in rocks. Ornithischian dinosaurs: Dinosaurs with birdlike characteristics. Predator: An animal that eats other animals. Saurischian dinosaurs: Dinosaurs with reptilelike characteristics. Sauropods: A group of large saurischian herbivores. Terrestrial: Relating to the land. Thecodonts: Early reptiles regarded as ancestors of the dinosaurs. The first evidence suggesting the existence of dinosaurs was the discovery of traces of their ancient footprints in sedimentary rocks. Sedimentary rocks are formed when sand, silt, clay and other materials are packed together under great pressure. Dinosaurs left their footprints in soft mud as they moved along a marine shore or riverbank. That mud was subsequently covered over as a new layer of sediment accumulated, and later solidified into rock. 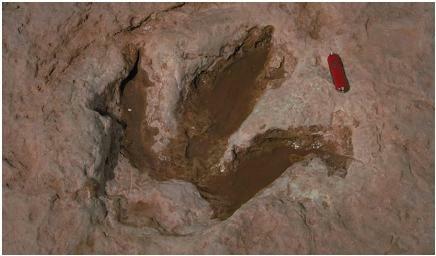 Under very rare circumstances, this process preserved traces of the footprints of dinosaurs. Interestingly, the footprints were initially attributed to giant birds. They were somewhat similar to tracks made by the largest of the living birds, such as the ostrich and emu. The first fossilized skeletal remains to be identified as those of giant, extinct reptiles were discovered by miners in western Europe. These first discoveries were initially presumed to be astonishingly gigantic, extinct lizards. However, several naturalists recognized substantial anatomical differences between the fossil bones and those of living reptiles. The first of these finds were bones of a 35- to 50-foot-long (10 to 15 meters) carnivore named Megalosaurus and a large herbivore named Iguanodon. Fossils of both were found in sedimentary rocks in mines in England, Belgium, and France. Discoveries of fantastic, extinct oversized reptiles in Europe were soon followed by even more exciting finds of dinosaur fossils in North America and elsewhere. These events captured the fascination of both naturalists and the general public. Museums started to develop extraordinary displays of reassembled dinosaur skeletons. This initial period of discoveries occurred in the late nineteenth and early twentieth centuries. During this period many of the most important finds were made by North American paleontologists (scientists who study fossils). An intense scientific interest grew over these American discoveries of fossilized bones of gargantuan, seemingly preposterous animals. Unfortunately, the excitement and scientific frenzy led to a rather passionate competition among some paleontologists, who wanted to be known for discovering the biggest, or the fiercest, or the weirdest dinosaurs. 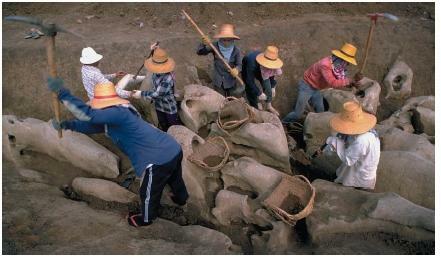 Other famous discoveries of fossilized dinosaur bones have been made in the Gobi Desert of eastern Asia. Some of those finds include nests with eggs that contain fossilized embryos (the earliest stage of development). The embryos have been used to study dinosaur development. Some nests contain hatchlings, suggesting that dinosaur parents cared for their young. In addition, the clustering of the nests of some dinosaurs suggests that the animals had led a social life. They may have nested together, for example, for mutual protection against predatory dinosaurs. By now, fossilized dinosaur bones have been discovered on all continents. Discoveries of fossils in the high Arctic and in Antarctica suggest that the climate there was much warmer when dinosaurs roamed Earth. It also is likely that polar dinosaurs were migratory, traveling to high latitudes to feed and breed during the summer and returning to lower latitudes during the winter. Although the most important fossil records of dinosaurs involve their bones, other sorts of evidence exist as well. In addition to footprints, eggs, and nests, imprints of dinosaur skin, feces, rounded gizzard stones, and even possible stomach contents have been found. In early 2000, paleontologists announced they had discovered the fossilized heart of a dinosaur that had died some 66 million years ago. Uncovered in South Dakota, the heart was encased in a natural sarcophagus of stone in the chest cavity of a dinosaur's fossil skeleton. Fossilized plant remains are sometimes associated with deposits of dinosaur fossils. These finds allow scientists to make inferences as to the habitats of these animals. Inferences also can be based on the geological context of the locations of fossils, for example, their nearness to a marine shore, or geographical position, as is the case of polar dinosaurs. All of these types of information have been studied and used to infer the shape, physiology, behavior, and ecological relationships of extinct dinosaurs. Scientists have only incomplete knowledge of the way in which dinosaurs were related to each other and to other major groups of reptiles. The reason for this fact, of course, is that dinosaurs can be studied only through their fossilized remains. These remains are often rare and fragmentary, especially those that are millions or hundreds of millions of years old. Nevertheless, some dinosaur species bear clear resemblances to each other, while also being obviously distinct from certain other dinosaurs. The dinosaurs evolved from a group of early reptiles known as thecodonts, which arose during the Permian period (290 million to 250 million years ago) and were dominant throughout the Triassic (250 million to 208 million years ago). It appears that two major groups of dinosaurs evolved from the thecodonts, the ornithischian ("bird hips") dinosaurs and the saurischian ("lizard hips") dinosaurs. These two groups are distinguished largely on the basis of the anatomical structure of their pelvic or hip bones. In general, dinosaurs can be classified as carnivorous (meat-eating) or herbivorous (plant-eating). Carnivorous dinosaurs. The carnosaurs were a group of saurischian predators that grew large and had enormous hind limbs but tiny fore limbs. Tyrannosaurus rex, perhaps the best known of all dinosaurs, was once considered the largest carnivore that ever stalked Earth's landscape. Its scientific name is derived from Greek words for "absolute ruler lizard." This fearsome predator reached a maximum length of 40 feet (12 meters), and may have weighed as much as 7 to 9 tons (6.5 to 8 metric tons). Tyrannosaurus rex had a massive head and a mouth full of about 60 dagger-shaped, sharp, serrated teeth. Those teeth grew to a length of 6 inches (15 centimeters) and were renewed throughout the life of the animal. This predator probably ran in a lumbering fashion on its powerful hind legs. The hind legs also may have been used as sharp-clawed, kicking weapons. Scientists think that Tyrannosaurus rex may have initially attacked its prey with powerful head-butts and then torn the animal apart with its enormous jaws. Alternatively, Tyrannosaurus rex may have been primarily a scavenger of dead dinosaurs. The relatively tiny fore legs of Tyrannosaurus rex probably only had minor uses. The long and heavy tail of the dinosaur was used as a counterbalance for the animal while it was running and as a stabilizing prop while it was standing. Tyrannosaurus rex 's distinction as the largest carnivore was taken away in 2000 when a team of scientists announced they had discovered the fossilized bones of a previously unknown dinosaur species that had lived about 100 million years ago. The bones of six of the dinosaurs were unearthed in Patagonia, a barren region on the eastern slopes of the Andes Mountains in South America. The scientists estimated that the needle-nosed, razor-toothed, meat-eating giant measured up to 45 feet (14 meters) in length. Like Tyrannosaurus rex, it had a tail and short front legs, but it was heavier and had slightly shorter back legs. It also was probably more terrifying than Tyrannosaurus rex. Not all of the dinosaurian predators were enormous. Deinonychus, for example, was a dinosaur that grew to about 10 feet (3 meters) and weighed about 220 pounds (100 kilograms). Deinonychus was one of the so-called "running lizards." These dinosaurs were fast, agile predators that probably hunted in packs. As a result, Deinonychus was probably a fearsome predator of animals much larger than itself. One of Deinonychus's hind claws was enlarged into a sharp, sicklelike, slashing weapon. The claw was probably used to slash and tear apart its victim. The most infamous small carnivorous dinosaur is Velociraptor, or "swift plunderer." Velociraptor attained a length of about 6 feet (2 meters). Restorations of this fearsome, highly intelligent, pack-hunting "killing machine" were used in the popular movie Jurassic Park. Herbivorous dinosaurs. The sauropods were a group of large saurischian herbivores that included the world's largest-ever terrestrial animals. This group rumbled along on four enormous, pillarlike, roughly equalsized legs, with a long tail trailing behind. Sauropods also had very long necks, and their heads were relatively small. Their teeth were peglike and were used primarily for grazing rather than for chewing their diet of plant matter. Digestion was probably aided by large stones in an enormous gizzard, in much the same way that modern, seed-eating birds grind their food. Perhaps the most famous of all sauropods was Apatosaurus, previously known as Brontosaurus. (The Apatosaurus was the first of the two to be discovered, and what was thought to be a different dinosaur, the Brontosaurus , was discovered later. In the 1980s it was discovered that they were really the same dinosaur, so they are all now referred to as Apatosaurus .) Apatosaurus achieved a length of 65 feet (20 meters) and a weight of 30 tons (27 metric tons). Diplodocus was related to Brontosaurus, but had a much longer body. A remarkably complete skeleton of Diplodocus has been found that is 90 feet (27 meters) long overall, with a 25-foot (8-meter) neck, a 45-foot (14-meter) tail, and an estimated body weight of 11 tons (10 metric tons). Brachiosaurus was an even larger herbivore, with a length as great as 100 feet (30 meters) and an astonishing weight that may have reached 80 tons (73 metric tons). What became of the dinosaurs? Many theories have been proposed to explain the extinction of the last of the dinosaurs about 65 million years ago. Some of the more interesting ideas include the intolerance of these animals to rapid climate change, the emergence of new species of plants that were toxic to the herbivorous dinosaurs, an inability to compete successfully with the rapidly evolving mammals, destruction of dinosaur nests and eggs by mammalian predators, and some sort of widespread disease to which dinosaurs were not able to develop immunity. All of these hypotheses are interesting, but the supporting evidence for any of them is not enough to convince most paleontologists that the dinosaurs became extinct for any of these reasons. Perhaps the most widely accepted theory today is based on the belief that a planet-wide catastrophe resulted in the extinction not only of the dinosaurs but also of hundreds of other species. Scientists have now found evidence that such a catastrophe may have occurred when a large asteroid struck Earth 65 million years ago off the northern tip of the Yucatan Peninsula of Mexico. In such an impact, huge amounts of dust and debris would have been thrown into the atmosphere. Carbonates and sulfate rocks would have also been vaporized, releasing chemicals into the atmosphere that produced sulfur and the greenhouse gas carbon dioxide. The dust and rocks would have blocked out sunlight for an extended period of time, perhaps for years, which would have killed off plants in large numbers. Deprived of plants, choking on carbon dioxide, and suffering showers of caustic sulfuric acid rain, the dinosaurs would have died out. We know now that asteroids hit the earth and caused bomb like explotions. But I have 4 other thereories (1) the apperance of rodents on the earth eating eggs (2) a huge asteroid hitting the earth on a fault line creating a huge earthquake. it would have leavled trees could have caused tidle waves of salt water it could have started the contianants to devide, etc... (3) dinosaurs where huge and the land was much different then ours, now. Bugs where bigger manny of the creachers where bigger, But many of the small creachers evolved, like crocks, turtals, igaunas, sharks, birds but every thing had to down size, may be because of smaller lands and diferent climate? or less food? (4) the plants being over grazed could have killed them off very easaly. The toxins in the leaves as a defence for the bugs, if plants are over gazed they will produce the same toxins, and kill off bigger plant eating crechers. Where did it happen first or did they all start to die out all at one time? I feel to know trully what happened you should look at the plants and creachers that died out and compare them to the animals that evolved and suvived. They had to down size, also I don't think a big cloud of dust covering the planit could of happened because all plants would have been killed off. The extintion of things wasn't just Dinos, it was giant water creachers, freshwater fish, saltwater fish, plants, trees, ferns, some turtles and all dinos that ran on two legs. Also what caused the Ice age. we seem to be looking at it through a narrow view of what it could have been now a days, not back then. It was very different then, then it was now, But I agree with the first responce that man has killed off many creachers, and they din't trully know how long we have been here on the earth, it is possible. But I'm not a dino expert.